This is a place to interactively examine the lessons from the 2009 Victorian Bushfires and similar events, with a view to finding solutions to the problems of living in an environment that can produce such fires. Individual isolated houses and tree lined streets need to be re-engineered to allow amenity and survivability. Population pressure, social expectations, the Australian Dream and Climate Change combine to put more and more lives at risk of bushfire. Many assumptions will need to be challenged. Things as simple as blacktop (asphalt) road surfaces have contributed to the tragedy. Please don't feel constrained by budget or technology, treat this as a brainstorming exercise. In 1939 radio communications were in their infancy and cell phones were science fiction. Commenting on this Page will be automatically closed on April 12, 2009. Which organisations are you thinking of pitching these ideas to? Local community groups? State governments? Just listening to the media reports we've learnt that people didn't know you need: metal standpipes to avoid them melting; electric start pumps so you don't have to take time out from fire fighting to start them; bunkers to wait out the worst of the fireball; hoses bigger than the usual common or garden type to deliver useful amounts of water. The Brumby government has announced a Royal Commission into the bushfires. An influential document in this Commission will be material from the National Inquiry on Bushfire Management and Mitigation, established by COAG. My initial thoughts on the matter have the following schema. Comparison with 2006-07 Australian bushfire season - burning over 1.1 million hectares of land over the course of ten weeks and 1994 Eastern seaboard fires, over 8,000 square kilometres. Major droughts in Australia correlate with severe bushfire seasons (e.g., Black Friday fires of 1939, Tasmanian fires of 1967, Ash Wednesday fires of 1983, South-East Australia 2006-2007). 2.2 "Too many trees, Green policies"
Zoos Victoria director of science and conservation Graeme Gillespie believes the number of animals that perished in the fires has been underestimated. "Back of envelope calculations put it in the tens or hundreds of millions of animals that have been killed in these fires," he said. AN ALEXANDRA man alleged to have deliberately sparked a fire that ripped through a neighbour's car and extensively damaged her home was yesterday refused bail in a Shepparton court. Standards Australia has accelerated the new building regulations - AS 3959 Construction of Buildings in Bushfire-prone Areas - in response to the Victorian bushfires. Ron Coffey, chairman of the Fire Protection Association of Australia, said the new national building standard being considered by Victoria would greatly improve survivability of houses. Housing Industry Association acting Victorian executive director Robert Harding said while it was easier to work with the new standards, the highest levels of heat-resistance would result in big cost increases. Research Objective: In order to improve planning and management of fire-fighting efforts as well as fire recovery activities, the OESC is attempting to introduce a standard classification of “assets” (including economic, social and environmental classes), a set of spatial data, and a risk model. The introduction of this standard model will allow improved collaboration between fire-fighting stakeholders at a state-wide level through to a local level. The Wildfire Risk Assessment Mapping project will allow local users to modify values associated with the spatial data, in order to reflect local knowledge. For example a road may be assigned a low value and be classified as such, but knowing that it is the only road between two towns it may be reclassified to reflect its true value. LAWS governing the clearing of native vegetation are under review as part of the Brumby Government's response to the bushfire crisis. Following strong public debate on being able to clear vegetation near homes following Victoria's devastating bushfires, the State Government has begun talking to building and local government groups on possible changes to the laws. Ideas have included transferring responsibility for managing native vegetation in areas zoned for housing from the Department of Sustainability and Environment to the Department of Planning and Community Development. My understanding is that a number of deaths occurred because people who fled had nowhere to go after towns were cut off quite early on in the fires. Would it be a sensible idea to built a central bushfire shelter in every town? Make a building out of a strong, non-burning material that can be well insulated and sealed (metal shutters for the windows, for example), with a cleared space around it, to which people can go in the case of a fire. Obviously, having a building just standing empty all year round would not be efficient, but if you make that building the pub, or the general store, or somewhere else that most people in the town go to all the time (and can thus find their way too blindfold, or smoke-blind), it would not just be a fire shelter but a reasonably comfortable place to wait out the fires. I recognise that fire shelters in individual houses would be a better solution for those who leave it too late to get out, but this would be a less expensive place to start - and I think bushfires are terrifying enough that some people might prefer to shelter in company with other people. I don't know if we have the materials or technology to build this sort of shelter (though I had the impression something like this had been done up at Mount Lofty after the Adelaide bushfires a while back), but it might be an idea to explore? Shelters would be a good idea but use with care; compare the two articles above "Gary Williams' Home" and "Cellars and dugouts could become death traps, warns expert"
you are a loud of crap and and i wasted 1 minuite off my life doing this. when i could have been doing something more valuable. .. like learning grammar and spelling, perchance? ineffective on many previous occasions. the recommended changes a reality. abrogation of the state’s responsibility to its citizens. My friend was involved in a bad bush fire that spread to a hostel quite a few years ago and he rescued a girl from the fire but tragically lost a couple friends to the fire. He's still really cut up about it to this day. I think you are right that education and prevention is key to helping to reduce the number and severity of fires. Let's just hope people listen and more importantly take the appropriate action. This is a really entertaining Site that you've put up there. I registered to your Page's RSS and hope you post more stuff that are equally well written. NSW Government budget cuts have meant that when today’s bushfire emergency hit, five Sydney fire stations were closed, and resources had already been diverted from four others. The Fire Brigade Employees’ Union said fire stations in Camden, Riverwood, Miranda, Mona Vale and Ryde were all closed due to budget cuts today, requiring Macquarie Fields, Ashfield, Botany and Newtown to be left vacant as crews were sent to cover their areas, while Ryde was not covered at all. As today’s bushfire emergency hit — with multiple fires in Western Sydney, the Hawkesbury, Blue Mountains and the Central Coast — Fire and Rescue NSW has had to recall off-duty firefighters to cover the gaps and closures. At Castlereagh, where a large fire is impacting rural properties, the local fire station was also closed on both Sunday and Monday this week. 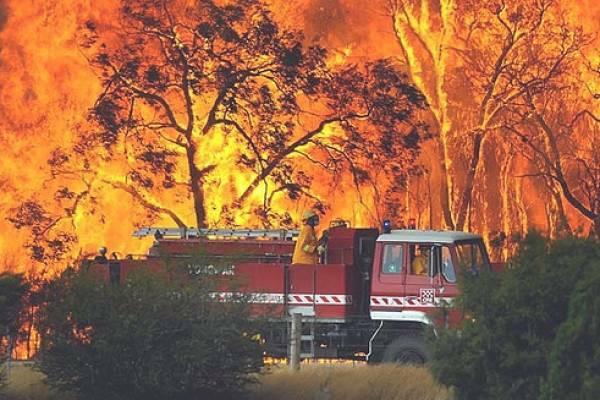 FBEU secretary Jim Casey said the nature of these bushfires had shown just how irresponsible the O’Farrell Government’s policy of closing fire stations was. “You don’t have to be a rocket scientist to know that hot weather and strong winds can mean bushfires, but it appears to be news to the O’Farrell Government who have been caught with their pants down today,” Mr Casey said. “Off-duty fire crews had to be called in as neighbouring stations raced to protect life and property, all because budget cuts have left large areas of Sydney without adequate fire protection. “Budget cuts and the irresponsible policy of closing fire stations meant that as fire conditions developed into a major emergency today, fire stations across the city were shut. Mr Casey said the State Government’s reckless approach to public safety was unsustainable, with today’s blazes catching them out well before the official start of the fire season. “We have been warning the community and the Government about this for some time,” Mr Casey said. “Fire stations, like all emergency services, are there for a reason — to respond quickly and on short notice. “Current budget cuts mean the State Government are treating fire protection like a game of musical chairs, shuffling resources around the city and hoping they aren’t caught out. “At some stage the music will stop and they will be left exposed, with communities around Sydney and the State the ones that will suffer.